Veni, vidi, vici: saw it on the Guardian on saturday, bought the ingredients on sunday and served it for Easter brunch on Monday. It was a spot on dish, very much in the spirit of the season. In case you wonder, it is an Yotam Ottolengi’s take on an Italian dish with lots of modifications to adapt it to what was left on the supermarket. I was getting a bit apprehensive as I kept replacing ingredients by similar thing, but, it all worked very well together… It was a process to do it, but it is a lovely dish, worthwhile the calories and the effort. Put a large sauté pan for which you have a lid on a medium-high heat. Add the oil and onion, and cook for 10 minutes, stirring from time to time, until the onion is soft and starting to colour. Add the chard stalks and celery, cover and cook for five minutes. Stir in the chard leaves and spinach. Cook for five minutes more, until the leaves have wilted and the stalks and celery have softened. Remove from the heat and set aside to cool a little. In case you don’t have a prepared pastry, roll half of it out pastry on a lightly floured work surface into a 30cm square that’s 2.5mm thick. Transfer to a 20cm-wide spring-form cake tin with 7cm high sides. Press the pastry into the edges of the tin and trim off most of the overhang. Roll the remaining pastry into a 25cm square lid and set aside. 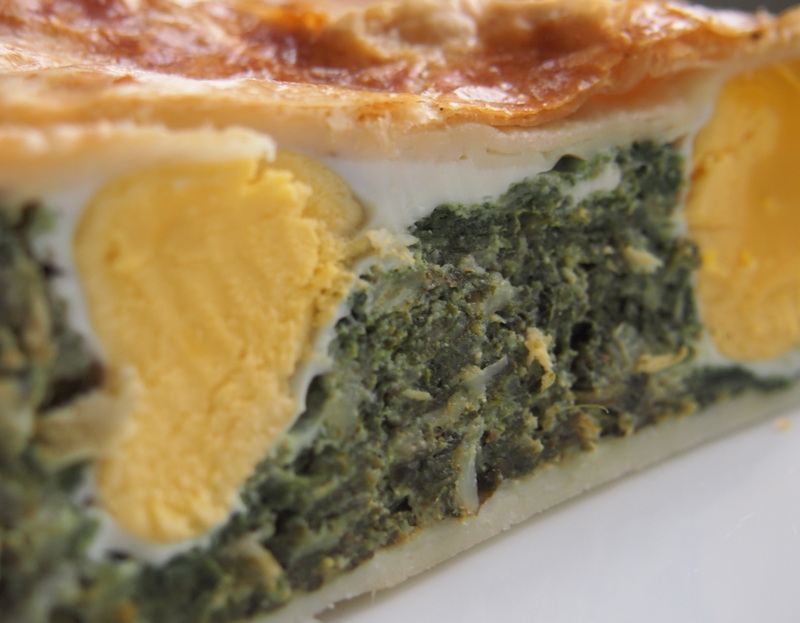 Tip the cheese and greens mixture into the cake tin and use a spoon to create five egg-sized holes. Break an egg into each hole, then lay the lid on top. Trim the edges, then pinch the lid and base together to make sure it’s secure. Totally – it was gone in less than 24h.